Air-conditioning has been used in many factories but people did not really know about this invention until the 1920s when hundreds of department stores, movie theaters, and restaurants installed these devices. People simply came to these places to get relief from the hot and muggy air outside. Central air-conditioning systems were developed in the 1930s and after World War II, hundreds of small units sold quickly and were often used in many private homes. Contrary to popular belief, an air-conditioning unit does not add coolness to the air. In fact, the opposite is true. It removes heat. An air conditioner works on the same principle as a refrigerator, but it is different in a sense that it is not designed to produce extremely low temperatures. The surrounding heat is taken from the air by the rapid expansion of a cooling substance (called a refrigerant) as it turns from a liquid at high pressure to a gas at low pressure. The warmed refrigerant passes through tiny openings of the valves, expands and turns partly into a gas at low temperature. When it reaches the evaporator coil, the newly-cooled refrigerant takes up the heat from the indoor air. The indoor air gives up heat to the refrigerant in the cooling coil and also loses moisture as it is chilled. The moisture then condenses on the coil and trickles down to the outside drain hole. In large installations, such as in office buildings and schools where there is central air-conditioning, a machine chills water that is distributed to a series of coils. The air from the building is drawn over of those coils and is then circulated to every room by blowers. The air travels through filters to coolers to the ducts and into the rooms. After circulating, the cool filtered air comes out of vents in the ceilings and returns to the air conditioner through the openings near the floors. 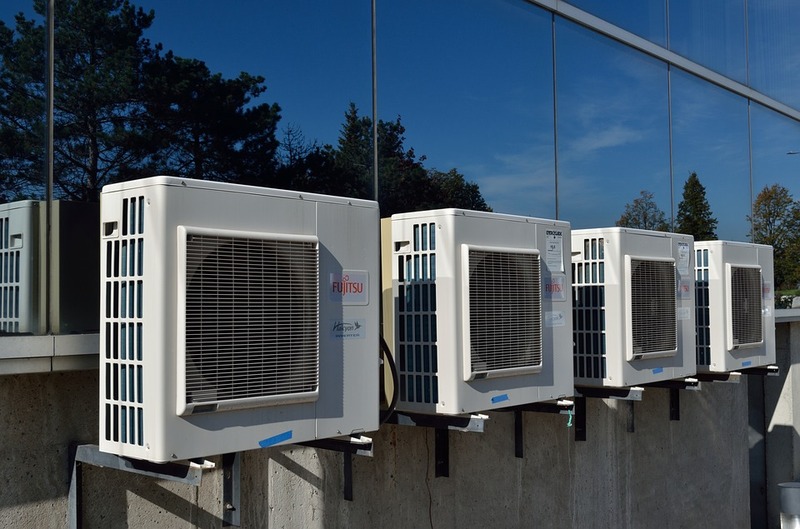 To be practical, today’s modern air-conditioning units have been designed to maintain a steady temperature, otherwise, we would have to turn the unit off and on continually as the temperature rose or fell. This self-adjusting feature is made possible by a temperature regulating device built into the unit called a thermostat. The thermostat is set at the desired temperature when the air-conditioning unit is turned on and then switches the cooling unit on and off when needed. Scientists predict that the air-conditioning systems of the future will work with what is known as thermoelectricity. A thermoelectric unit is extremely small and very quiet. It is made up of tiny pairs of semiconductors that are connected in parallel to an electric current. These pairs produce cooling and heating effects on opposite ends at the same time when a direct current flows through them. This is called the Peltier effect. If the current is reversed, the cooling and heating functions are also reversed. Thermoelectricity will be able to cool and heat your entire house very cheaply in the future. This entry was posted in Air Conditioning Services by Whit Kinser. Bookmark the permalink.